Fluctuating Distance – Is This normal? Our first recommendation of course is to have your system checked out. Once your system has been given the thumbs up consider other factors such as the length and type of your antenna, performance characteristics of your radio – tuned or stock? and finally terrain and atmospheric conditions. Read on for a scientific explanation of what is really going on under the hood so to speak. Scientists track solar cycles by counting sunspots — cool planet-sized areas on the Sun where intense magnetic loops poke through the star’s visible surface. Hathaway is an expert forecaster of sunspot numbers. “Sunspot counts peaked in 2000 some months earlier than we expected,” he recalls. During solar maximum, magnetic fields above the Sun’s surface become impressively tangled, particularly near sunspots. Twisted magnetic fields — stretched like taut rubber bands — can snap back and explode, powering solar flares and coronal mass ejections. 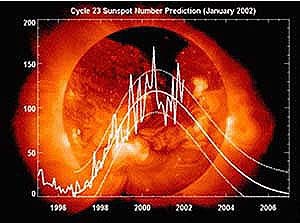 The subsequent dip toward solar minimum seemed premature to Hathaway, and indeed it was. Before long, sunspot counts reversed course and began to climb toward a second maximum that now appears to be only a few percent smaller than the first. Solar Max eleven years ago was much the same. A first peak arrived in mid-1989 followed by a smaller maximum in early 1991. Sunspots are the most visible sign of those complex magnetic fields — but not the only one. 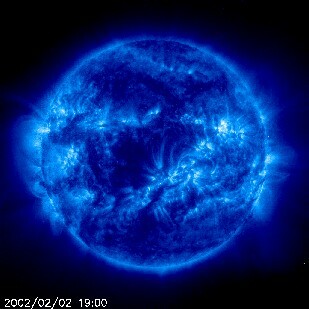 Another sign is solar radio emissions, which come from hot gas trapped in magnetic loops.